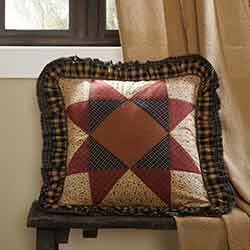 Stout courthouse step blocks of country black and burgundy balance dainty floral patterns in the Maisie Quilt, featuring 8-point stars set in tan Irish chains. Courthouse step blocks are arranged to create lines of black and burgundy. Hand-quilted, 100% cotton, reverses to black and tan check found on front. Part of the Mayflower Market Collection by VHC Brands. The Maisie Tier Set takes a ditsy floral pattern found in the bedding collection and features it as the signature design for a perfectly coordinated look throughout the home. The Maisie Valance takes a ditsy floral pattern found in the bedding collection and features it as the signature design for a perfectly coordinated look throughout the home. The Maisie 63 inch Panel Set takes a ditsy floral pattern found in the bedding collection and features it as the signature design for a perfectly coordinated look throughout the home. 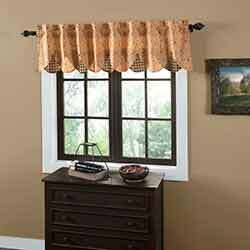 The Maisie 72 inch Valance takes a ditsy floral pattern found in the bedding collection and features it as the signature design for a perfectly coordinated look throughout the home. The Maisie Panel Set takes a ditsy floral pattern found in the bedding collection and features it as the signature design for a perfectly coordinated look throughout the home. 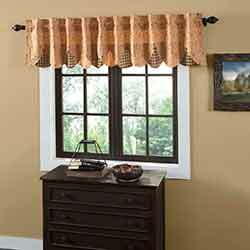 The Maisie 90 inch Valance takes a ditsy floral pattern found in the bedding collection and features it as the signature design for a perfectly coordinated look throughout the home. 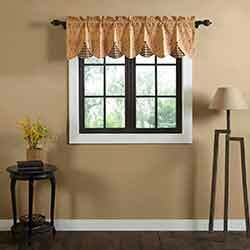 The Maisie Euro Sham features a ditsy floral print on a tan base. The Maisie Bed Skirt features a ditsy floral print on a tan base. The whimsical qualities of this bed skirt make it perfect for pairing with the stout log cabin blocks on the quilt. 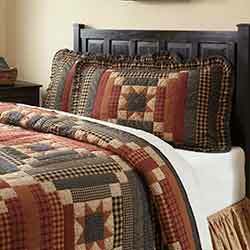 The Maisie King Size Quilt features 8-point stars set in tan Irish chains of ditsy floral prints. Stout courthouse step blocks of country black and burgundy balance dainty floral patterns to create a look with wide appeal. 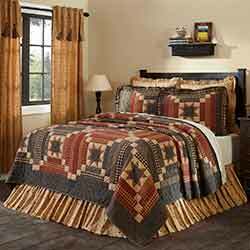 The Maisie Luxury King Size Quilt features 8-point stars set in tan Irish chains of ditsy floral prints. Stout courthouse step blocks of country black and burgundy balance dainty floral patterns to create a look with wide appeal. The Maisie Luxury Sham features a single 8-point star centered in a tan Irish chain of ditsy floral prints. 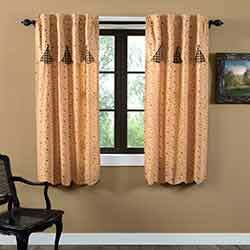 Features an enlarged eight-point star framed with ditsy floral prints and finished with gathered ruffles. The Maisie Queen Bed Skirt features a ditsy floral print on a tan base. The whimsical qualities of this bed skirt make it perfect for pairing with the stout log cabin blocks on the quilt. 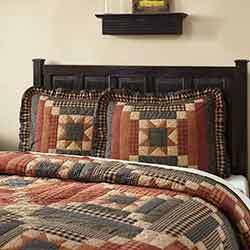 The Maisie Queen Size Quilt features 8-point stars set in tan Irish chains of ditsy floral prints. Stout courthouse step blocks of country black and burgundy balance dainty floral patterns to create a look with wide appeal. 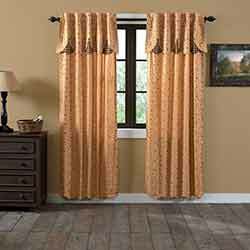 The Maisie Standard Sham features a single 8-point star centered in a tan Irish chain of ditsy floral prints. The Maisie Twin Bed Skirt features a ditsy floral print on a tan base. 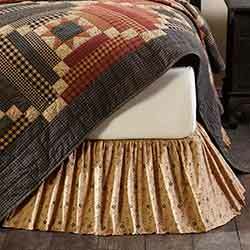 The whimsical qualities of this bed skirt make it perfect for pairing with the stout log cabin blocks on the quilt. The Maisie Twin Size Quilt features 8-point stars set in tan Irish chains of ditsy floral prints. Stout courthouse step blocks of country black and burgundy balance dainty floral patterns to create a look with wide appeal.